Patients with an appointment are taken care of first. If you don’t have an appointment, you might have to wait a little longer than usual. However, waiting time rarely exceeds one hour. The images and the report are sent electronically to your doctor within 30 minutes of the examination. You receive a written report as well. Please take it with you to your referring physician to discuss the results. 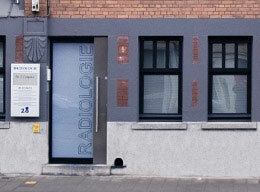 As a patient, you can watch your images at www.rxgent.be. Have you lost the reference number? Please call +32 9 233 08 93. Please use only one referral document for each diagnostic problem. You can issue multiple prescriptions for the same day. Do I get the results of my radiology examination? You receive a written report after the examination. The images and the report are also sent electronically to your doctor within 30 minutes of the examination. If we have to do additional research or compare the current results with prior radiology examinations, we report our findings to your referring physician within 24 hours. We can forward the images and report to a doctor of your choice, e.g. if you would like a second opinion. Please provide us with the name and email address of this physician. You can easily access your images online. We do no longer issue images on transparent film or paper. Have you lost your reference number? Our clinic is located at the intersection of Martelaarslaan (inner city ring) and Groot-Brittanniëlaan (the road with the tram tracks). Central Station “Gent Sint-Pieters” is at 1 km walking distance. 3 parking spots just 150 metres away, situated near Martelaarslaan 11 (a street off Groot-Brittaniëlaan). What do I bring to my radiology examination? Wear comfortable clothing and underwear. Wear clothing and underwear without strass or metal. X-rays are a form of ionising radiation and are potentially dangerous. However, the benefit of the X-ray examination is more important than the estimated risk. Doctors are specially trained to weigh the risks and benefits for each medical examination. We work according to the ALARA principle: As Low As Reasonably Achievable. This means we minimise the radiation doses to keep any potential harm reasonably low. Information about the delivered radiation doses is stored for any future reference.